Wonderful is Number One in the charts. Well now, that’s enough to put a spring in your step. 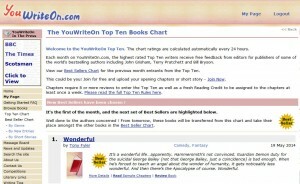 I belong to an online writing group, called www.youwriteon.com. It’s a mostly convivial place, with some really impressive writers on it. By all means, click the link and come play. It offers peer reviewing, and a deliciously enticing prize. If you happen to be in the top ten rated stories at the end of the month, you get your work shoved beneath the noses of (usually) some major publisher or other. Naturally, the top ten is a place people contend hotly to be, but there’s a degree of science in the methodology of getting there. You earn “reading credits” by reading and reviewing other people’s work. You can only review a maximum of six pieces per day, and you score them on all the things you’d expect – characters, plot, dialogue, description etc. These “reading credits” are what you assign to your own work, and the more you have, the more reviews you yourself can get. There’s a background algorithm that stops you being reviewed by those with whom you have most interaction on the site. For every five reviews you get, you can remove one, and so boost your rating. Now, look again at the image that accompanies this entry. Wonderful, the book I’m beginning to work on today, has had its first seven thousand words on the site for some time, and today – bingo! 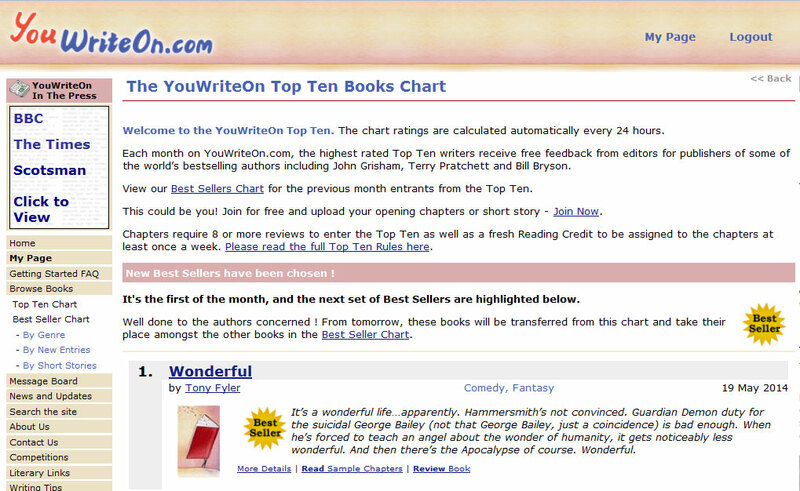 Number one spot – which means it will get a professional critique from a publisher in all likelihood. Of course, getting a professional critique does not equate to them loving the work. They may send me back with my tail between my legs. But either way, it’s going to be in front of people I need to impress, ultimately, and it’s an experience from which I can learn. Even if I say so myself – and you know I do – that’s a Wonderful beginning. Much of the day has been spent making sure this website is basically intact, ready to be the platform for the next three months, and my writing challenge. Now it’s the night before I begin, and it feels oddly wonderful. It feels like being on the brink of some sort of holiday, but a holiday away with my own characters, on their adventures. I’m looking forward to seeing where they take me. I know the stories of my first two novels in at least broad terms, but it’s going to be a challenge – a real, hard-work challenge – seeing where the stories go in terms of the nitty gritty. Do my story ideas work with real characters? Will they make sense? Will the tone be right? Am I sure which readership I’m aiming at? I think I know the answers to all these questions. But the point is that as an editor, I’ve seen plenty of authors who think they know the answers to these questions, but with my outside eyes, I’ve been able to advise them that the answers they think they know are actually not evident in their manuscripts. So while the adventure feels wonderful, I’m trying to be realistic and self-aware of the level of challenge involved in the next three months. Realistic, but ultimately positive. I’m looking forward to this. I’ve been working with fellow author and superb illustrator, P.S. Brooks, to visualise some of the characters in my books. 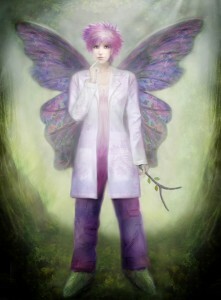 He’s done a superb job with Peony, my scientist fairy. Peony’s also a long-distance flying champion, so Patrick has delivered her in a number of outfits. Peony now has a proper flying helmet, as she’s also a champion long-distance flyer. She has bronze, silver and gold flying badges, won in various competitions. She has proper leaf-boots and a truffle-leather flying jacket. 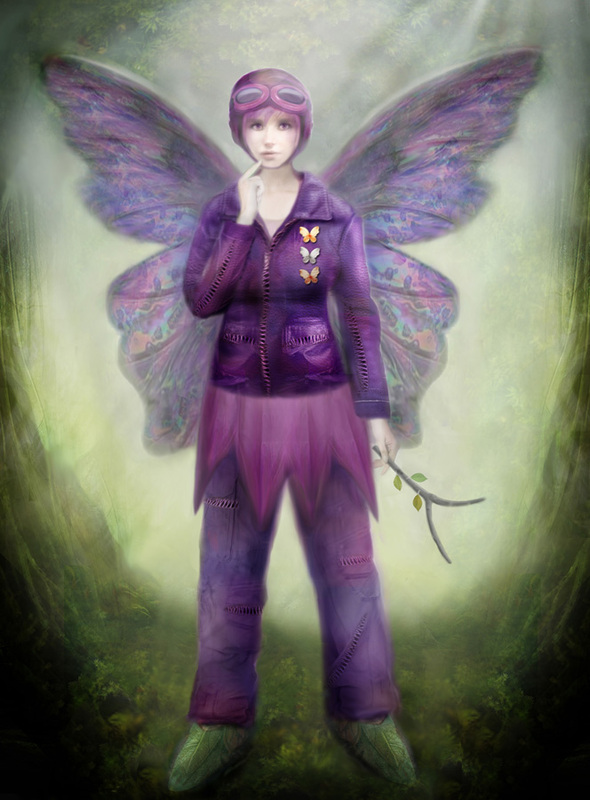 The jacket, and the pockets on her camo pants, are sealed not with zips and buttons, but with the enchanted “mouths” of venus fly traps, which only she can open without losing a finger. At home, relaxing, Peony dons her lab coat, which is slowly being imbued with her flower-fairy nature, just as her flying jacket and her dress were before it. The power of visualisation is that it opens up your characters to new levels of thinking. I’ll be re-writing many of Peony’s scenes from the 1st August to take account of Patrick’s superb visualisations. Enjoy the continued talents of P.S. Brooks, ladies and gentlemen. Writing hat on head – Check. 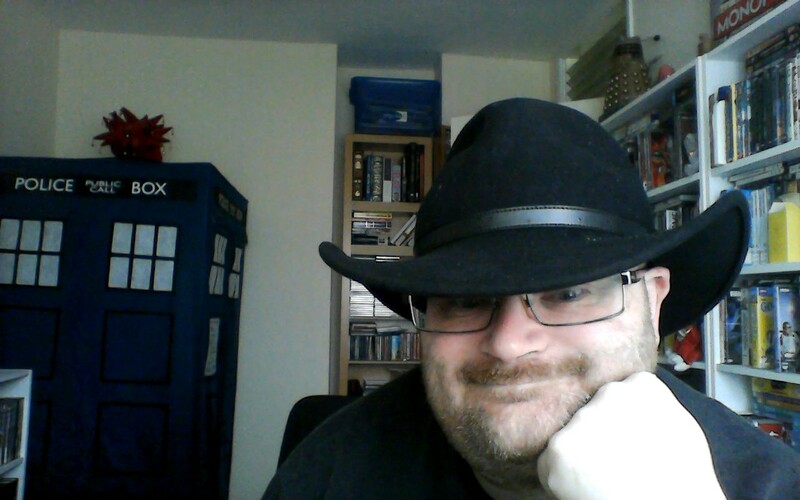 Tardis in background – Check. Head full of words – Check. Hello writers, readers, agents, publishers, and occasional wanderers-in. My name is Tony Fyler, and when I was 24, I was going to be a writer. That was it, there was no Plan B, no pension, no pretension to actually working for a living, nothing. I was going to be a writer. I’d known this with a certainty you could break rocks on since writing a story in primary school, aged 9, in which the Daleks, the Cybermen and the Martians from War of the Worlds, battled each other for the planet, and my teacher had given me an A for it, along with the somewhat cryptic and exhausted comment, “Very Imaginative”. So when I was 24, I wrote a novel. Just like that. Locked myself in my room for a couple of months, and just wrote it. As it happened, BBC Radio Wales had a book review show at the time, on which unpublished authors could send in their first few chapters, and if they were good enough, get a critique from a publisher. A real one, like John Jarrold, Simon Spanton etc from companies like Pan MacMillan, HarperCollins, Orion and so on. Not knowing what to do after that, I became a journalist, pretty much to spite them. The thing is, I’ve always, since that time, thought of myself as a writer, despite not doing very much in the way of proper creative writing. I’ve dabbled, and I did finish a second manuscript, but that was very much too long and complicated, made little sense in the third act and has what I’m reliably informed are “tonal issues” here and there. Now, I am an editor by trade. I still have no pretensions to actually working for a living, but now some people are nice enough to give me money to edit a magazine and a website, and lots more people are nice enough to give me money to tell them how to fix their novels, and yet I still haven’t written and published one of my own. That’s going to change. From 1st August – 31st October, 2014, I am taking a three-month sabbatical from my editing company, to focus on my writing. No, I’m not mad enough to think it only takes three months. No, I’m not going to give up after that. But clearly, nearly 20 years on, I’m many things, and I still think of myself as a writer. Which means it’s time to finally write something. Write it and sell it. So that’s my challenge to myself: One of my day jobs continues – the magazine and website one. But I’m taking time off my own company to invest in my writing. This website is where you’ll find out how it goes. There’s information on my current Works In Progress – the two books I’m aiming to push forward first, entitled Wonderful and Happily Ever After respectively. It’s also where you’ll find links to my short fiction and non-fiction articles when they’re published elsewhere. We have links to some realy cool stuff – some of it writing related, some which will just improve your life immeasurably. There will be blogs – on the process of writing, the inspiration, the frustration, the challenge and hopefully the triumph. There will be blogs about editing and publishing too – what to do, what not to do, and why, and how, and lots of other subjects beside, though all writing-related. And there will be news – both of my work when it’s published either online or in traditional format, and news from the literary world, competitions, opportunities to get noticed, published or to win a bit of cash. Three months to write, edit and begin to try to sell at least one market-ready novel, maybe two.